"SpaceX has two absolutely insane projects that would not only bankrupt the company." The comments came during an investor call for Tesla, the electric car manufacturer where Musk is also CEO. Though his language was colorful, the two projects he blamed for the SpaceX’s tight purse strings are indeed complex. Starship is the company’s oft-renamed rocket that it plans to use to transport crews of up to 100 humans to Mars and the Moon. Starlink will remain closer to home, but is still ambitious: it’s a network of satellites that the company plans to use to offer global broadband internet. 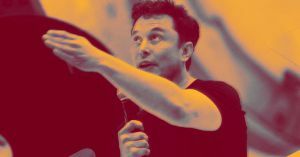 Starship and Starlink are putting such a strain on SpaceX’s finances, Musk said during the investor call, that the company is going to need to remain fiscally cautious until they’re completed. “SpaceX has to be incredibly spartan with expenditures until those programs reach fruition,” he said.